Daily, are organized in a jointly practice sessions at Temple, will be held the morning prayer at 7:00 and evening prayer at 19:00. Every month will take place in the Malhão Stupa, Temple Hunkara Tsok cerimony in Guru Rinpoche day and Dakinis day. Project construction of 108 STUPAS in Chanteloube, Dordogne, France. Eight great stupas are being placed around the first main stupa Chanteloube, where are done the traditional three-year retreats. These central Stupas are then surrounded by a wall with 108 small stupas, each containing relics, prayers and a niche as a statue of Buddha. Tulku Pema Wangyal Rinpoche hopes that the greatest possible number of people may be involved is supporting construction, because establishing a connection with such an effort is a source of immeasurable benefit. It is said, among other things, that the resulting merit of building a stupa is equal to the number of atoms contained in each stupa, and that this figure will last as long as the stupa remain there. 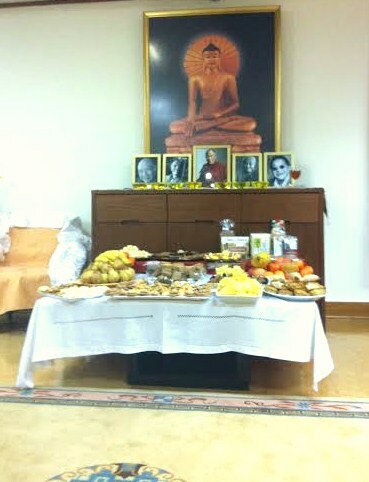 Rinpoche, on each occasion, has selected the best quality materials and the best methods and techniques in order to ensure maximum sustainability. 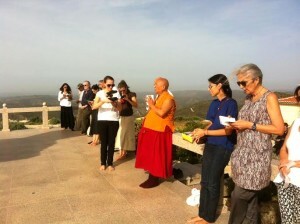 Taklung Tsetrul Wagyal Pema Rinpoche, visited the Stupa Malhão on 22 October. He made an offering of lamps and practices Stupa and temple in Malhão. 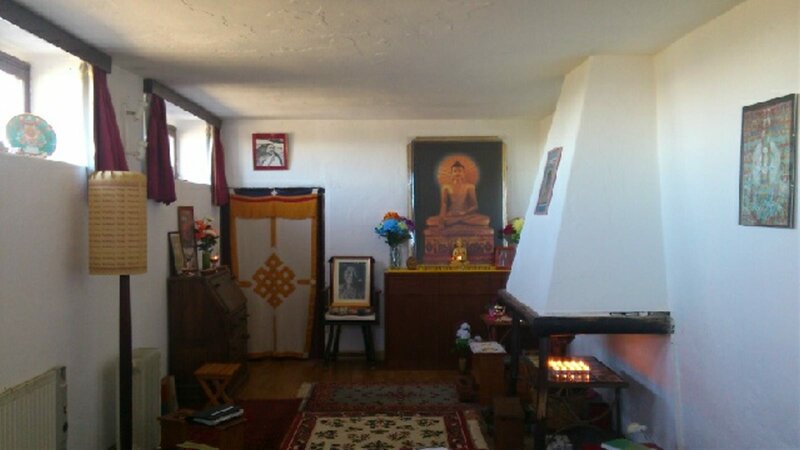 Also Rinpoche visited the Rangdrol Rinpoche room at the mill, and checked the work of repairing roof on the kitchen, dining room and new rooms for retreat. 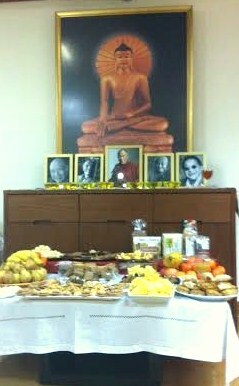 Daily morning and evening practice sessions are also held in the Temple at 7:00 am and at 7:00 pm. Activities: To fulfill its aims, STUPA began its activities on 31st of October 2012, inviting to teach and guide prayer practice sessions at the Malhão estate its teaches and mentors – Tulku Pema Wangyal Rinpoche, Jigme Khyentse Rinpoche and Rangdröl Rinpoche. Daily morning and evening prayers group practice sessions are held in the Temple, as well as religious ceremonies known as “Tsok” which are held on the 10th and 25th day of each lunar month of the Tibetan calendar. In 2012, we have tried to provide the conditions for practitioners in solitary retreats through restoring houses and equipment already available at Malhão estate. 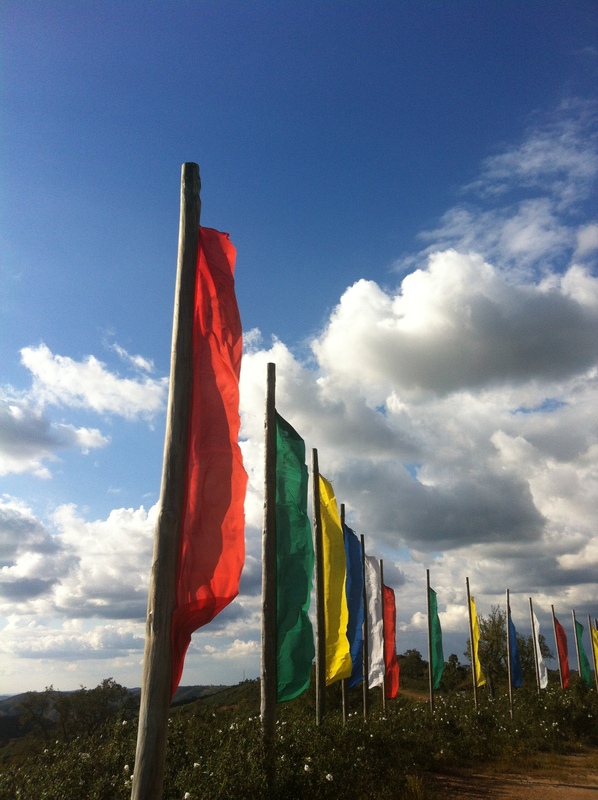 On Tibetan’s new year and according to the tradition, Tibetan prayer flags were hoisted near the stupa at Malhão estate.